Birendra Sen is the Business Leader and has the overall responsibility for Tech Mahindra Business Services. He has spent 12 years in the organization, managing multiple portfolios. Birendra has been instrumental in driving Digital Transformation at TechMBS, led the integration of TechMBS with Tech Mahindra post acquisition and has led the overall growth of TechMBS. Birendra is passionate about making TechMBS a great place to work, and driving digital transformation in the customer management world. For his outstanding contribution to the overall business, Birendra has been recently awarded the Tech Mahindra Associate of the year. He has 16 years of work experience spanning industries like Financial Institutions, IT, ITeS and Telecom. He is a Bachelor in Engineering from NIT, Bhopal and an MBA in Marketing and Strategy from IIM Lucknow. When he is not at work, he can be found singing, playing the guitar or travelling to jungles for his photography. Sanjay Choithramani is the Business Leader for the Australia Business Unit of Tech Mahindra Business Services. He is responsible for leading the customer relationship management operations for one of the largest telecom brands in Australia and New Zealand, executing business strategy and ensuring operational excellence company-wide. His strengths lie in the areas of Digital, Global Technology Support, Customer Support, Account Management, P&L Management, Education and Training, Benchmarking, Program Management, Strategic Planning and Organizational Transformation. He is COPC certified registered coordinator for CSP, Certified Lean Sigma Professional and Certified Grow More Coach. On the personal front, Sanjay loves spending quality time with his wife, twin daughters and parents. Beyond work, his interests lie in exploring new places, watching movies, playing sports, listening to music and photography. Rajesh Bhatia is the Business Leader for the Ireland Business Unit of Tech Mahindra Business Service, managing the offshore and onshore customer relationship management operations for one of the largest telecom service providers in Ireland. Part of the founding team that set up TechMBS in its earlier incarnation as a captive customer support centre supporting customers across Europe & Australia, Rajesh initially led the development of the Automation & Software Development function. In this role, he was instrumental in overseeing the design and development of over 150 business support tools that have helped drive operational efficiencies. His strength lies in building and managing Customer Support operations & Service Delivery functions. His portfolio includes both voice and non-voice operations of Customer Service, Technical Support both 1st & 2nd Line, Tele Sales, Collections, Fraud Control, Transaction Processing and Back Office. With in-depth expertise in Business Process Management, Rajesh has played leading roles in both in captive and outsourced operations. In his current role, Anil is managing Finance, Legal, Audits, Facilities & Properties (F&P) for TechMBS. He also manages Finance & Business Assurance for Tech Mahindra Ltd - Business Process Services. He has been with the TechMBS since inception & has been an integral part of the core team leading its growth journey. 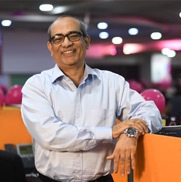 Amongst his contributions to the business, he was a key player when TechMBS was acquired by Tech Mahindra in 2012, and over the last 3 years, he has supported strategic contract renewals of key business accounts for the organization. Key achievements include ERP implementation, Automation of transport management, Integrating areas in F & P, contract negotiations & managing high end litigations. Anil comes with over 20 years of experience in the area of Finance, Legal, Taxation, Transfer Pricing, Project Pricing, Treasury, Risk Management and Financial Planning. He is a qualified Chartered Accountant, Cost Accountant & Company Secretary. 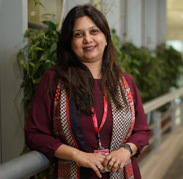 Suchitra Kerkar leads the people function for Tech Mahindra Business Services. With 24 years of work experience, she is a firm believer that talent and culture are the key drivers of our success. Her goal is to find incredible people, spark off their passion to give great customer experience, through a culture where they feel they can deliver the best in their careers. She leads the Business HR, Corporate HR, Brand & Communication, Talent Acquisition, Organization Development as well as Compensation & Benefits functions. On the personal front, Suchitra is a movie buff, loves listening to music or reading a good book. She also loves spending time with her pets. Kunal Dayal is the Senior Vice President for Operations Support at Tech Mahindra Business Services. She has over 15 years of experience in Operational Planning, Design and Delivery in the customer relationship management industry. Kunal is responsible for all the support departments which are a primary interface between the operations and our clients. She oversees the seamless delivery of support capabilities comprising of Change Management, Programme Management Office, Business Intelligence, Business Finance, Internal Audits, Work Force Management, Business Readiness Testing & Systems, Monitoring and Continuous Improvements as well as Learning. Having joined the organization in 2002, her blend of people management skills and operational excellence has delivered proven results to the business. In her personal time, Kunal is a food connoisseur and enjoys globetrotting with her husband and son. She is passionate about running and of late, is huge on Instagram with her cooking escapades. Paresh Varma is the Senior Vice President for Operations at Tech Mahindra Business Services. He has operational responsibility of the Digital Services Organization called Eservices and the Commercial vertical. He also manages the Customer Complaints Department. His key responsibilities include 'Improving Customer Experience' and driving down Customer Complaints. It also includes achieving the 'Commercial goals' like, Bad Debt Management through Collections, reducing Customer Churn, Meeting and Improving Revenue and Margin goals (ARPU, AMPU) through Retention. His responsibility for the Eservices team includes 'Providing World Class Digital Services Options' to customers apart from managing the Eservices Operations. In his personal time, Paresh enjoys Trekking. Avinash Panchal is the Vice President for the Information Technology, Application Testing, Automation & Software Development. He has been associated with TechMBS for over 10 years. He started his journey in TechMBS with Process and Change and then moved on to establish Systems Delivery and Business Readiness Testing function. Avinash holds a Post Graduate Diploma in Business Administration. Under his leadership, many business critical IT projects and systems have been successfully deployed across multiple geographies. He has been instrumental in bringing Enterprise Mobility to TechMBS. Beyond work, he loves travelling, photography and sports.